This is a busy time of year at a search-marketing firm. People are maximizing their advertising and refocusing their campaigns in order to reach the holiday shoppers. We build out a lot of specialized campaigns for the holiday season in order to meet the needs of our clients. We are also seeing advertisers stop running campaigns due to the holidays or the economy or both. This is the biggest mistake you can make this time of year. I understand times are tough for a lot of companies and industries out there. However, there are some ways that you can cut down on spending without eliminating your advertising completely. 1) Don’t turn off ads. Even if you only run half of your regular budget you are better off than losing visibility altogether. 2) Reevaluate bid levels. Low positioning is better than nothing at all. You want to make sure you aren’t getting shut off mid-day due to your reduced budget. We have used this tactic for a few people looking for ways to cut costs and we have been pleasantly surprised by the results. It seems there are a lot of people out there pulling the plug on their advertising so your positioning might be higher than you think at those reduced bids. 3) Narrow your focus. This is a great way to get more bang for your buck when your bucks are limited. Restrict your spending to areas with a high ROI. You can also try pausing more general terms and running on more specific terms. You might loose a little bit of your brand awareness for those highly searched terms, but you are going to keep yourself profitable. 4) Give your campaign a holiday twist. Just because you don’t sell children’s clothing doesn’t mean that you can’t use the excitement of the holidays to draw people in. 5) Pricing! Pricing! Pricing! Between the economy scare and the upcoming holidays people are looking to cut costs anywhere they can. Try incorporating ads that are focused on reduced pricing or special offers. You don’t have to be giving things away, but as long as people think they are going to be saving they will be more likely to click. Don’t forget the people who are waiting until the first of the year to purchase your product or service. One thing we always see in paid advertising is delayed conversions. As an account manager here at Wpromote I look at daily conversions for my clients. I also look back at the end of the month to see how many conversions occurred from previous clicks. This happens all the time. People often browse sites, bookmark them and come back later to make a purchase. Generally people making big decisions such as signing up with a new insurance provider, redesigning their garage, or buying a $2,000 vacuum tend to think about it for sometime. This is something you are going to see in full effect through the month of December. Although people are more concerned with their holiday parties than they are with getting new flooring installed, it doesn’t mean that they aren’t thinking about which company they are going to use. 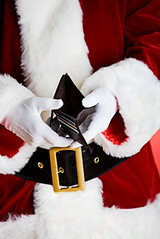 Personal purchases slow down at the end of the year because spending is going toward holiday gifts. However, people are planning for all of the things they need to do or buy after the new year. You don’t want consumers making decisions on their upcoming purchases when you don’t have an online presence. Cut back spending, but don’t cut back altogether. Remember, maintaining visibility in the search engines is important. You are going to loose current and potential customers if they are looking for you and can’t find you. Don’t let your competitors take advantage of your need to save money. Find a balance that allows you to cut costs, stay profitable and keep your name where people can find you. I hear Google is the place to be. Happy holidays and happy advertising! better yet, companies should stop wasting money on print ads and INCREASE their PPC budgets! any businessman worth their weight knows the 4th quarter is the last chance to dive into the black! Better yet, companies should INCREASE their PPC budgets for that 4th quarter rush! You gotta spend money to make money…or push those books outta the red and into the black!